The term “2 Sigma” comes from the results of the study, which showed that students who were provisioned with a combination of one-on-one mentorship and mastery learning performed two standard deviations (“sigma”) higher than students in a conventional classroom setting. To put it another way, nearly all the students (98 percent) who were educated with one-on-one mentorship and mastery learning did as well as the average student in the comparable classroom setting. Mastery learning is an educational approach where educators work with a student as long as necessary to ensure the student has mastered one topic or skill before moving on to the next. Mastery learning can be applied either in small classrooms or with one-on-one mentorship. The tutoring process demonstrates that most of the students do have the potential to reach this high level of learning. I believe an important task of research and instruction is to seek ways of accomplishing this under more practical and realistic conditions than the one-to-one tutoring, which is too costly for most societies to bear on a large scale. Several technology startups have launched “online mentorship” products in the last five years. Thinkful created a structured, online mentorship program in 2012, while AirPair and HackHands emerged with on-demand mentorship services in 2013. Udacity added “coaches” to their online programs in 2013, while Pluralsight acquired HackHands and Udemy partnered with CodeMentor earlier this year. These products take advantage of unique strengths that technology can provide to scale mentorship and resolve the 2 Sigma Problem. Remote videoconferencing creates liquidity in a mentor-student marketplace: If mentors aren’t constrained to the geographic location of their students, it becomes much easier to connect the right mentor to the right student. While Bloom may have imagined mentors reciting lessons and provisioning lectures, lessons and lectures can be recorded (often with higher production quality than a live lecture) so mentors can focus on individual students. When the constraints of a classroom are removed, students can move through course material at their own pace. This allows mentors to practice mastery learning and tailor education to their individual students. Every aspect of the student experience is quantitative by default in an online program, allowing mentors to have fine-grained visibility into their students’ progress. Instead of proctoring an exam once every month, mentors can monitor their students’ engagement and progress in real time. Tools that automate logistics like scheduling, messaging and tracking allow mentors to work with more students (while still providing individual attention) than would otherwise be possible in a traditional classroom setting. 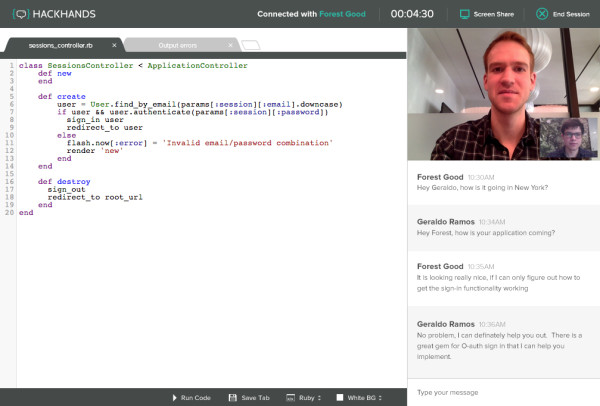 Screenshot of a HackHands session (source: CrunchBase). Bloom’s research shows that a student’s ability to learn is strongly affected by the educator’s approach. This means trying to assess which students are likely to learn a given skill might not be helpful. Even moving a below-average student from a classroom to an individual tutor can have significant benefit. Using technology to increase the reach of mentorship will amplify these results. Bloom’s study demonstrated a method where 90 percent of students scored the same as the top 20 percent of students in a conventional classroom setting. A more recent study corroborates similar results: In 2004, a Harvard study found that individually mentored math students outperformed their classroom peers by 200 percent on standardized state math tests. If these statistics hold in practice, resolving Bloom’s 2 Sigma Problem could be the greatest educational breakthrough since Socrates. Startups are using online mentorship to combine the strengths of technology with the unique value of human beings. But without randomized, controlled experiments comparing online mentorship programs with conventional classrooms, how can we verify and reproduce Bloom’s results with these programs? While online mentorship addresses many of the issues identified by Bloom, online environments might have negative trade-offs that neutralize the benefits of one-on-one mentorship and mastery learning. For example, MOOCs (massive online open courses, like edX and Coursera) have notoriously had difficulty continuously engaging students and suffer from very low retention rates. An online program, where a student isn’t locked into a physical classroom, might have more difficulty keeping students engaged. There are no studies on the specific structure of “online mentorship,” but there are a few on online education in general. San Jose State University partnered with edX to trial a “flipped-classroom” model, where it demonstrated a 46 percent improvement in pass rates. It was not a randomized trial, so it’s possible that students self-selecting into the flipped-classroom model are inherently more likely to perform better. Again, neither of these studies specifically examined online mentorship, only online education. In this study, face-to-face means “offline and in a classroom setting,” but this model of online education blended with a face-to-face component hints at the strength of online mentorship. There’s room for more research on this approach, but so far it seems that startups are using online mentorship to combine the strengths of technology with the unique value of human beings to make a fundamental change in how we teach.